Product Profitability for Excel (Profit Contribution Breakdown) allows to identify the level of surplus or profit generated by different components or revenue streams of your business. This analysis can be used to increase revenue by allocating marketing resources to more profitable product lines or revenue streams. By applying relative indicators to reflect the amount of variable and fixed expense (resource) a component consumes, surplus and contribution levels are calculated. The component performance is combined with indicators for future potential and business ability to identify areas that will maximize current and future performance. Product profitability summary recommendations are provided for each breakdown and results presented in graphical and tabular form. This business tool can analyze any chosen component of an overall business or product line. Default breakdown is five customer segments and five product groups. 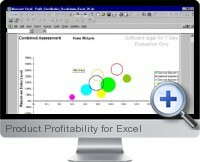 Product Profitability for Excel is available free for 7 day evaluation.